Your battlefield partner or team mate with whom you accomplish a common mission. Some one you trust with your life. The person who is watching your back when in a combat zone while you are watching their back. After many heartfelt conversations with the SPN Family, it became clear we can all benefit from having a Battle Buddy in our lives. 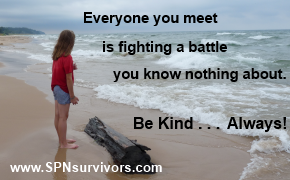 Someone we can partner with to help us fight our own personal battles against disease, depression, negative feelings about ourselves and any other challenge we come face-to-face with in our daily lives. Our faith, family and friends fill that role as much as possible but sometimes we need something tangible, a visual cue, we can focus on to encourage us, bring a smile to our face, and remind us to Always Keep Fighting for better days ahead. That tangible item can be a photo, a letter from a loved one, a special gift or souvenir, or one of our cute and cuddly Battle Buddies – specially chosen stuffed animals with words of encouragement on a custom designed bandana. 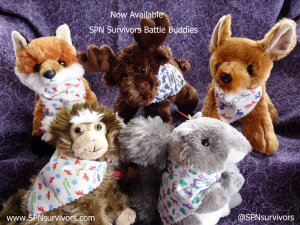 Shortly after SPN Survivors was created in 2014, we were inspired to create a personal Battle Buddy that can accompany you anywhere you need some extra support. 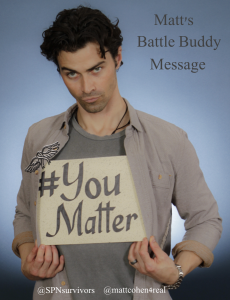 We asked several of the Supernatural cast members to provide the words of encouragement and they were more than happy to support our idea. Thank you Jared, Jensen, Misha, Matt, Travis and Osric. SPN Survivors has opened an Etsy store where you can purchase our Battle Buddies for yourself or a friend, along with our custom designed t-shirts, wristbands and buttons. We hope these items encourage you and remind you to Always Keep Fighting for better days ahead because #You Matter! 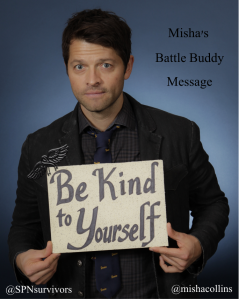 Thank you for supporting SPN Survivors. Helping People, Saving Lives, The Family Business! 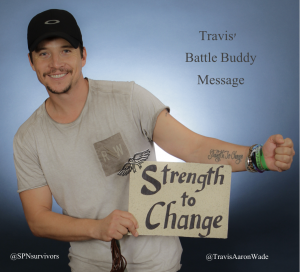 If you would like to Donate to our fund to help us deliver our Battle Buddies to those who are in need of encouragement at counseling offices, schools, hospitals, please visit our donation page.